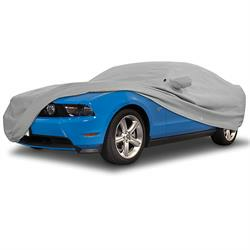 Four Layer Construction For Maximum Vehicle Protection !! NOAH® is a highly sophisticated non-woven fabric comprised of 4 layers. Using a unique (patent-pending) construction process Covercraft NOAH® barrier fabric provides a high level of outdoor protection for today's softer water-based paint finishes. Dual Protective Outer Layers: Two layers of bi-component spunbond, using a side-by-side spinning method. Each fibre is a perfect balance of polypropylene and polyethelyne to combine softness with strength. Microporous Film Middle Layer: A breathable, barrier film layer with a unique stretch-film technology. This material is stretched, then chemically processed to produce microscopic holes to allow condensation, heat and any water ingress to evaporate through the cover, whilst being small enough to prevent dirt and dust infiltration. Soft, Paint-Protective Inner Layer: A single, heavier layer of bi-component spunbond using side-by-side spinning technology provides a soft inner fleece-feel lining for today's delicate water-based paint finishes. This extraordinary new concept makes the Noah Cover exceptionally soft yet strong. Hand washable, the cover is lightweight and compact for easy storage and daily use.